Pickering College was founded as the West Lake Seminary by Quakers in 1842 and, as you might expect, has had a long and interesting history since. Canada became a dominion, the school amalgamated, some buildings burned down, others were built up. It began as a co-ed school, something unique at the time, and as such provided an expression of the Quaker ideal that both sexes should be educated equally. It was also the first school in North America to offer a course in typewriting, symbolic of the school's desire to encorporate new ideas and technologies, and to educate students with an eye to the world they would enter upon graduation. Times of course have changed, though certainly many of the values that the school upholds today reflect those with which it was founded, including a desire to embrace new ideas and to support a diversity of interest. The ideal student is one who will thrive in a supportive yet challenging academic environment. Pickering College is full of surprises. Some are perhaps of less academic import than others, though all contribute to the character and the singularity of the overall environment. It’s the second oldest JK to Grade 12 school in Ontario, and the third oldest in the country. It’s the only school in the country that runs its own radio station. It houses the Canadian Quaker Archives and Library. It also has artwork painted by Franz Johnston, a member of the Group of Seven who taught here, and a mural by resident artist (1933-34) Harold Haydon that dominates a wall in the gym. “It’s amazing that no one really says anything about it,” says headmaster Peter Sturrup, “because it’s a little bit provocative.” It’s also huge. Haydon meant to depict the dawn of the universe, including the dawn of humankind—so the content is grand, including everything from local fauna to cell division. There are lots of people depicted, too—none wearing clothes, yet modestly arranged. JK students giggle, “but it’s always been here, and it’s just part of the school,” says Sturrup. “That’s where some of our Junior School students have their basketball and volleyball games with visiting teams, and every so often somebody must walk in and do a double take there.” No doubt they do, in part because so little fuss is made of it. In addition, Group of Seven artist Franz Johnston’s paintings are found throughout the meeting hall, a cornerstone of the collections that the school has accumulated over the many years of its life. It’s affecting that art of this calibre can be such a common, everyday part of student life. And the surprises continue from there. Rogers House, the building that dominates the campus, was designed by John Lyle, who was also the architect for Toronto’s Union Station. It’s beautiful, to be sure, if a bit monolithic. For a school that is progressive and forward looking in so many ways, the initial gestalt is strikingly traditional: lots of Georgian heft and might. Apparently Lyle wanted to put a dome on top, but the Religious Society of Friends—the formal name for the Quakers—nixed it as too showy. But yes, it’s a beautiful building, nonetheless, and it is the hub of the campus. In celebration of the 100th anniversary of the school in Newmarket, a student and his father, who is also an alumni, created a model of Rogers House out of Lego. It’s as fun as it sounds, and it’s on permanent display just inside the main doors of the dining hall. The more you wade in, the more you realize how singular the school is, and how unique it is within the Canadian academic mosaic. It was founded by Quakers, and was co-ed at a time—1842— when, well, schools simply weren’t, to say nothing of the society at large. For the bulk of the school’s existence, it has operated as non-denominational, though consistently following some Quaker principles and practices, which, if you have a sense of those traditions, are immediately apparent on entering the school. Students meet each day in the Meeting Room, sitting in rows facing the centre, just as they would in a traditional Quaker Meeting House. Once gathered, the students stop talking as if on cue, though there isn’t actually any cue. “It’s noisy and then it’s quiet,” says Sturrup. “It just happens.” Once quiet—again, without any cues or order of ceremony—students and faculty stand to give announcements. It’s striking. Should two people stand at the same time, the one behind defers to the person further forward, nearer the centre of the room. It’s all very democratic, which, of course, is itself a core Quaker value: all voices are considered equal. All of these little things contribute to a much greater whole. Students don’t dwell on it much—the ones we spoke with see all of these things as normal, everyday, just as fish don’t give much thought to the water that they swim within. Per the alumni we spoke with, the benefits of the environment become clear when they move on into post-secondary life and beyond. Many rightly cherish their experience with the school, as expressed through the high attendance levels at various alumni events throughout the year. Because they believe every person has worth, they’re pacifists, and have become quite well known historically for their pacifism. They won the Nobel Peace Prize after World War II for their work helping the victims of the wars. Pickering College is a coeducational day and boarding school in Newmarket, Ontario. It offers a liberal arts education and includes a Junior School (comprising JK through Grade 5), a Middle School (comprising Grades 6 through 8), and a Senior School (comprising Grades 9 through 12). The stated mission of the school is to “instil in each individual the ability and responsibility to make the world greater, better, and more beautiful than they discovered it.” Values, as well as the global perspective, are key components of the programs; since it was launched in 2013, the Global Leadership Program (GLP) has been a defining feature of academic life. In our experience, that entrepreneurial spirit is shared across the faculty—there is strong leadership, balanced by teachers who feel they are given latitude to impact the life of their students and the life of the school. Because the GLP was developed and implemented so recently, even the newest faculty members feel that they’ve played a part in significant changes and have had an impact on the program. There is a nice momentum to it all, as well as a sense of ownership, and the faculty clearly feels a close responsibility to seeing all of those changes realized. The school was founded at a Quaker settlement near Picton, Ontario. The house where the first classes were held still stands, and is now a private residence. It had indoor plumbing and a septic system, so it was at the apex of domestic architecture for the time. Classes were first offered in 1841 and only girls were admitted, in part because of the need to build facilities to house the boys. It also reflected the Quaker ideals around gender equality. To say that this was unheard of for the time is an understatement: the Persons Case wouldn’t be initiated for another 80 or so years, yet here was a school that believed that girls had as much right to an education as boys did. When coed classes began in 1842—the year that the school cites as its founding year—boys and girls learned side by side. It was registered as the West Lake Friends’ Seminary. Despite the name, and again in keeping with Quaker ideals, from day one instruction was non-denominational and open to all who wished to enroll. There were some ups and downs along the way, including varying rates of enrolment. In 1877, the school moved to Pickering and found a new life there, housed in buildings that were perhaps more akin to the architecture of the other notable schools of the time, such as Upper Canada College and Ridley College. Like the property at West Lake, it was a point of pride that all amenities were up to date, including, once again, indoor plumbing. The school also began drawing students from further afield, including international students from Japan, Russia, China, Australia, and the West Indies. At a time prior to even a national railroad, that’s particularly impressive. The student body grew, as did the alumni network. An event in 1894 was attended by more than 400 old boys and girls from across the country and beyond. Then, as was inevitable for large institutions at a time when lighting was oil lamps, and heating was coal, in 1905 a fire consumed the main building. The school would rebuild, and at first it was assumed that it would do so on the present site, something that was reported in the press at the time. But, with the growth of the various communities, and the development of reliable rail transportation to Toronto, Newmarket offered benefits that Pickering couldn’t. Ultimately, the school was built in Newmarket in 1909, high on a hill overlooking the surrounding farmland. It remained a rural setting until relatively recently. The context is more urban today, though the views, seemingly from every window, are still remarkably impressive. When in September 1927 Pickering College began to function once more as an educational institution, we, as the student body, were presented with a new conception of how a school should be operated. The conception was, as aptly expressed by the first editor of the Voyageur, “education without tears.” No longer were we obliged to submit to the tyranny of a group of elderly school masters whose word was law. We were allowed to come and go as we pleased on our own responsibility. Instead of stern task masters we found a group of young but competent teachers who were willing to meet us half way and to consider our point of view. The ‘habit of obedience’ forced upon the impressionable nature of a child does not develop judgment and will, but does develop that fatal facility in following other people’s wills, which tends to make us a hopeless mob—mere sheep, instead of wise, free, strong individuals. The habit of submission to authority, the long, deeply impressed conviction that to ‘be good’ is to ‘give up’—that there is virtue in the act of surrender—this is one of the sources from which we continually replenish human weakness … Those who know no other way of modifying a child’s behaviour than through ‘making him mind’ suppose that if he were not made to mind he must be utterly neglected. … the rich years of childhood should be passed in the acquiring the habits of self-direction. You’d be hard pressed to find a better description of what private education—the rich years of childhood spent learning self-direction—in the decades since, would become. As the 20th century progressed, schools would seek to promote the habits and values that Statten championed at Pickering College, as well as within the YMCA youth outdoor education programs, Camp Couchiching, and the summer camps that he founded and which continue to bear his name: The Taylor Statten Camps in Algonquin, Camp Ahmek and Camp Wapomeo. All of that—the development of the programs, the approach to the learner, the development of personal will—is evident throughout the school today. Yes, time has moved on, and our concerns aren’t clustered around the kinds of things that Statten was specifically reacting to, but the foundation that began with the Quakers, and reinforced in Statten’s time, are evident throughout the school today. The meeting room, for example, reflects the Quaker belief in the value of everyone’s voice. Seats are set facing the middle of the room, and while there’s a podium, staff and students don’t sit at the foot of it, but around it. During meetings, students have many opportunities to speak to the student body, both formally and informally. The day we visited, a Grade 12 student spoke about his experience working with children with autism in his home country of Taiwan. Announcements are delightfully casual and democratic; students and faculty simply take turns, standing up when they’re ready to speak. If two people, or more, stand at the same time, the one closest to the podium goes first. It sounds like it could risk being a bit of a jumble sale, but it’s not. Rather, it’s all very orderly, polite, and pointedly without a sense of hierarchy. The student talking about the soccer game is given as much respect as the faculty member noting that applications for an Australian student exchange are available for anyone who is interested. The Meeting Room is in many ways the heart of the school, and while most probably don’t think of it in these terms, the social organization there is an analogue for what happens throughout. It also houses some nice visual reminders of the school’s heritage. A memorial wall honours those who served in the World Wars. On the other walls are painted panels, one for each of the provinces and territories in the Canada. Most were painted by Franz Johnston, a member of the Group of Seven who also taught here. Those for Newfoundland and Nunavut—both of which became part of the country after Johnston’s time at the school—were added later, painted to match the style and feel of the originals. All combine to create a very unique feel to the room, nicely reflecting the culture of the school. While the school had been run by the Canada Yearly Meeting of Friends, in 1917 all assets were transferred to an independent corporation. In 1927 it became a boys’ school and was run as one until 1992, the same year as the school’s 150th anniversary. That year also saw the addition of the Junior School, extending the program from JK to Grade 12. “We made a conscious choice not to be [International Baccalaureate (IB)],” says Kim Bartlett, director of teaching and learning, “because we wanted the custom build. We could make partnerships that enhance our work.” There was also a conscious decision not to offer Advanced Placement (AP) courses. She adds, “I don’t believe AP is the way the world is going anymore,” noting that it is exam based, founded in the drill and kill perspective. She also notes, using Georgetown University in Washington, DC, as an example, that universities are trending toward a portfolio model, rather than ranking by marks alone. The decision to create a program from the ground up was, nevertheless, a strikingly bold move, and one that began a new era in the life of the school. Pickering College’s Global Leadership Program (GLP) shares some similarities with the IB: both encourage an international perspective; both are hands-on and academically rigorous; both are based on a core set of values; and both stress interpersonal communication and collaboration. Unlike the IB, the GLP is a custom diploma program entirely unique to the school, with students working toward it in concert with the requirements necessary for completion of the Ontario Secondary School Diploma (OSSD). “When we designed it, the goal really was: ‘what do we want our graduates to be able to do at the end?’” says Bartlett. “It was really about imagining the ideal graduate.” As such, it was essentially reverse engineered from that goal, based on an understanding of the skills they would need to have to succeed, while also cognizant of the attributes and experience that universities would be looking for. Bartlett jokes that she doesn’t get much sleep, given the range of things that she’s involved with at Pickering. Her enthusiasm for the work, and the school, is nevertheless infectious. When she gives examples, the source of that enthusiasm is evident. “I’ve got a student right now, he was sort of an early prototype” of the Capstone project, the culminating activity in the GLP. Students in Grade 11 write a research proposal based on a global issue of their choosing, suggesting solutions and implementation, which they ultimately pitch in front of a judging panel. “He was the first kid in that program, and [the first] to test some of the pieces. He crowd-sourced his solution, and right now he’s at Northwestern University in engineering. He’s worked on Spider Man equipment—you know, where you can climb walls and ceilings—and he just finished working with Elon Musk for the last fuselage” for the Mars mission. “In all of our programs, there is a strong focus on real-life experience,” says Noeline Burk, head of arts. “In visual arts, it’s about learning the techniques of painting and sculpture, but I also spend a great deal of time with the students on being able to critique work, and analyze work, and understand the process of informed judgment. As well, I think what a lot of these kids will need to be able to do is write formal proposals and be able to prove to someone that their idea is the best idea.” In a recent Grade 12 class, students were asked to propose a piece of public sculpture. The students toured locations in Newmarket, developed sculpture concepts, built maquettes, created a budget based on real numbers, wrote a proposal, and then presented it to a panel. “It’s not just whether or not you’re the best artist in the class; it’s about being able to develop an idea and see it through to a successful ending,” Burk explains. It’s impressive, but also relates well to the goals and concepts of the GLP. Art, Burk believes, is about more than communication, and it should be used to develop communication and presentation skills. On entering the school, students become part of a shared culture of curiosity, while also being reminded that everyone brings something unique to it. One student told us that “everyone has that one strength, and some weaknesses. Someone can be really good at French, but maybe not so great in other subjects.” They seem to appreciate that latitude, and don’t feel the need to be good at all things. As such, there isn’t an overt sense of competition among students for marks or athletic performance, something that was confirmed independently by a number of students from across the senior grades. The staff promotes that approach subtly, though the culture of the school does as well, as underscored each day within the meeting hall. Noeline Burk, head of arts, oversees the operation of the only JK-Grade 12 radio station in Canada. Gareth Sturrup is the station manager who runs the day-to-day radio programming and coordinates with the school’s students and community volunteers. At Pickering, 102.7 CHOP FM was created by the generosity of a parent at the school with experience in radio, Jim Waters, a past owner of CHUM FM. The station began broadcasting in 2007, initially intended as little more than a special interest club. “Initially I think Jim’s idea was just to get the kids on the radio, but the school has taken the mindset that, yes, get the kids on the radio, but let’s make it curriculum enhancing. And I think we’re doing an amazing job of that.” And they are. The day we visited, a number of Grade 5 students were getting ready to interview a politician from Toronto, one of a series of interviews that are far deeper and more informative than you might think. The station is applying to the CRTC to become a community station. At the moment it’s only licensed as a campus radio station. The designation will bring an enhanced signal strength as well as an enhanced profile. Even without that designation, the station operates just as a professional one would. The kids do morning and evening drive programs, lunchtime shows. “We’ve got one student in Grade 12 who does a heavy metal show and it’s incredibly well received,” Burk says. Some staff and community members also participate on and off air, a volunteering opportunity that the school intends to continue growing. The concept may seem out of date, though the resources are deceptively useful. One of the Grade 12 students we met was on his way to record a podcast of his Capstone project, presenting the results of his work. Kids are clearly excited to be on air and to use the studio, while the school is keen to ensure that it supports and augments the curriculum. And, from all indicators, it’s doing that in spades. That’s part of a clear focus on the basics—the program is designed nicely, with an emphasis on the core competencies of writing, speaking, and numeracy. Curriculum development gives explicit attention to eight key areas: leadership, global awareness, design and building, public speaking, empathy and perspective, environmental stewardship, friendship and community, and literacy and language. It’s a lot of moving parts, to be sure, but all have been designed to fulfill the curricular expectations while building the groundwork for what students will be doing in the middle and high school grades. “It was developed from the bottom up,” says Di Mambro. “You’re always looking for ways to improve your program,” and she notes that the scope and sequencing of the junior grades was informed, first and foremost, by an understanding of the skills and knowledge they’ll need to be successful in the middle years. “For Grade 2, they have a vermi worm composter,” she says with a chuckle. She admits that the first year didn’t, um, go so well. “It was actually quite a disaster, but that’s a great example” she’s quick to add, with regard to how the project was handled, and the experience it granted the students. “Thankfully, that Grade 2 teacher is a very strong science person,” says Di Mambro. “It took two weeks of real learning. Those kids did the research they needed to do, and it was amazing to watch … They found that they had given the worms too much fruit. They had been overfed. But they learned what they did wrong, and they corrected it. They learned how to fix their problem.” It’s wall-to-wall charming—we saw the composter, and the worms seemed happy, so far as we could tell. “We want kids doing more critical thinking and problem solving,” she says, “so that’s the main reason for our inquiry-based learning and our project-based learning. We’ve done a lot of professional development for our teachers on that.” She’s demonstrably adept in her role developing the programs, though her passion also resides with the kids, the things they’re doing in the classrooms, and the interactions they’re having with their peers, mentors, and instructors. Which, frankly, is as good a sign of a school’s health as you can ever hope to find. There’s a strong relationship with the upper grades, including cross-generational instruction, getting the Grade 11 students into the junior classrooms to speak, lead discussions, and teach a few lessons. “We did a little bit of that when I first came here,” says Di Mambro, “and now it’s almost daily.” Those are the kinds of things—the worms, the Grade 11 students in the classroom, the outdoor ed trips, the Lego robotics—that give spark to the delivery of the curriculum. Likewise, she is keen to ensure that all the teachers are leading from their passions, the areas that they feel particularly confident within. Co-curriculars are mandatory until Grade 12. In Grades 9 and 10, the year is divided into four terms, and students are required to be engaged in something every term. It could be a solo activity, such as rock climbing, equestrian or debate, or participating in team sports, including the competitive teams. By Grade 11, students are able to take a term off, and often students will take the spring term off in order to maximize their time around the ISPs and exams. In Grade 12, students are able to take two terms off if they wish. While physical activity is encouraged, co-curriculars include arts activities. While there is a core offering that remains, there is some latitude for both students and faculty to initiate co-curricular activities. A recent example is Anime, a program created at the request of a group of students. All offerings are organized around the overall goals of the school curriculum and the GLP. In some cases, the instructional links may not be entirely clear on the face of it—there is a cooking session, for example—though faculty are keen to bring leadership, creativity, interaction, and resiliency outcomes to the fore. All coaching is handled in house. The soccer program is particularly strong, as are volleyball and basketball. Ultimate frisbee is a recent offering, but has proven exceptionally popular among the students. Excellence is prized, though ethical competition is as well. School teams participate in the Conference of Independent Schools Athletics Association (CISAA) and the Ontario Federation of School Athletic Associations (OFSAA). One student told us, “I love the community … it’s so small, everybody knows each other. I just think everybody feeds off each other. … because we are a small-sized school, a lot of the events that we do … for them to have a good turnout, it has to be a large chunk of the school [participating],” something he sees as a plus. “For example, at other schools, when there’s a dance, it’s mostly the seniors. Here [they include] Grades 9 to 12. Everybody knows each other, there’s a lot of interaction. … everything we do is as a big school community.” He appreciates being known, both socially and by the faculty, as he advances through the grades. The school is divided among houses that compete throughout the year, culminating in Sports Day at the end of the school year. As elsewhere, the houses grant a sense of participation and belonging. Not all are that on point or goal directed, and that’s fine too. One student told us that he wasn’t sure what he wanted to study in post-secondary education, but that he is taking a careers course as well as speaking with an academic counsellor, something that began with his entry into the school. This is a culture of curiosity, and that includes not rushing into anything—students feel that there is some space to try new things, take some ideas for a test drive, and then direct their interests into a specific course of study. When we asked some Grade 8 students what they wanted to do in life, one responded “Well, we’re pretty young!” The others were quick to agree, which is nice in that it suggests that, yes, this is an academically rigorous environment, but at the same time, kids are allowed to be kids and to grow into their interests at their own pace. Interestingly, the student who is heading into neuroscience cited the music teacher as a particular inspiration during her time at the school. “He was always there for extra help when I needed it. And he shaped me not only through my music career—I play the clarinet in symphonic band, and the tenor saxophone in jazz band—but he’s also given me skills to succeed academically and in the real world.” That kind of cross-pollination of interest is discussed as a signature aspect of student life. We asked students what they didn’t like about the school, and unanimously it was blazer day on Thursday. Which, is also a pretty good sign of school health. If all that Pickering College is doing wrong is insisting on blazers one day a week, the corollary is that there’s a lot they’re doing right. The boarding program begins with Grade 7. Different programs are offered based on age and stage. “We try to provide a home away from home,” says Mason. They live in families headed by boarding staff who live in residence with the students. Associate faculty live in residence with the kids. They tend to be young teachers, or new to the school. The families are made up of 10 to 12 same-gender students from Grades 7 through 12. “It’s meant to provide mentorship, that big-brother, big-sister, little-brother, little-sister scenario,” Mason explains. They have activities, family meetings, and meals together. Weekends are busy with activities, from shopping to theatre trips to outdoor activities. The delivery of any school’s wellness program is invariably an expression of a school’s size. In larger settings, there are more wellness departments, such as on-site medical care, psychologists, and a range of counselling services. Smaller schools, of course, don’t have all the bells and whistles. That said, the close community has a lot of benefits—being known by staff, having a consistent and long-term counsellor, and gaining a longer-term relationship with specific members of the faculty are invaluable. And that’s true of Pickering. There are three nurses in the health centre, including one that is resident on campus. “We have a doctor who comes in and is on call to us all the time,” says Mason, as well as a mental health counsellor who attends campus one day each week. The health centre is staffed from 7 am to 7 pm every weekday. Outside that, a nurse is on call, ensuring access 24/7. “It’s a community-wide effort: it’s our faculty, our admin staff … it’s a collaborative responsibility,” with equal attention given to boarding and day students. Students in the Senior School are assigned to a faculty advisor who will remain in that role for the duration of their time at Pickering. Students meet with advisors in groups of eight to 10. They sit with them every day in Morning Meeting and hold advisor lunches three days a week, when they sit together as a group. Otherwise, advisors make themselves available to their advisees informally outside of those meetings. “So it was pretty much a daily interaction,” says alumna Nicole Wolscht, and one that she appreciated. Having graduated in 2013, she’s still in regular touch with her advisor to this day. There is commensurate guidance staff, the path to care is a team approach, and could be initiated by either staff or academic counsellors. There are also two specialists on campus tasked with providing classroom accommodations, one for the Junior School and one for the Senior School. “In the Junior School,” says Patrick Peotto, assistant head of academics, “all the teachers have their special ed [qualifications] and that helps them in being able to identify when learning issues are emerging, and be as proactive as humanly possible” around remediation or emotional regulation. For boarding students arriving from overseas, the school is able to source a local guardian if needed, available for a fee. Again, because of the size of the school as well as the relative size of the boarding program, faculty at times serve as guardians, as was the case with one of the boarding students we spoke with. Opportunities to enhance the interconnectedness of the school community are both sought and acted upon. Food services are tasked to source food locally as much as possible, and they also ensure that students are aware of that fact. Meals are served family style, which is charming as well as in keeping with the Quaker values that the school is founded upon. As such, the dining hall serves as a regular and robust interface with the school community. In the Junior School, students sit at tables with their teachers, rather than staff sitting separate, which is lovely to see. That instance is indicative, says Peotto, of the school’s more general approach to behaviour and discipline. “Instead of looking at things in a very black and white way … we try and look at things in a flexible way, with the student’s best interest at heart.” Whenever issues arise, Peotto meets with parents and guidance staff, and together they build a proactive plan. Each case is unique, but Peotto’s instinct is to first approach each instance as a wellness issue, rather than a disciplinary one. Because all students are known—this is another benefit of the size of the student body—attention is given to extenuating circumstances, whatever they may be, as well as patterns of behaviour. Peotto speaks of progressive discipline, which is a friendlier version of three-strikes-you’re-out: a one-off is seen for what it is, and addressed appropriately and empathetically. A pattern of ongoing behaviour, too, is addressed for what it is. In all cases, says Peotto, families are notified very early on. Grades, of course, are important, but they are only one part of what the admission team is looking for. They’ll be looking at how students contribute to the school they are arriving from and how they contribute to their community. Community service is a core value of the Pickering offering, so arriving with some demonstrable experience there is certainly a plus. They’re also looking at breadth, including involvement in athletics and the arts. That can all sound onerous, though the admission team is clear that it’s less about achievement than it is a willingness to engage with others and to try new things. Once at Pickering, students are expected to take part in all aspects of school life and be willing to push the boundaries of what is comfortable for them. Again, they don’t have to be on track to saving the world, but they should be curious about what’s happening in the world, both in their local communities and further afield. They may not ultimately love taking part in debate or canoeing down the Nahanni River, but they should arrive willing to give it a shot. While a global gaze and the values of global citizenship have been an aspect of the program since it was founded, there was a renewed dedication to that with the development of the Global Leadership Program. The right fit for Pickering, perhaps now more than ever, is a student who is prone to thinking in a global way, inclined to seek out active roles in the school and beyond, and whose personal goals mesh well with all of that. The school strongly encourages that students gain some hands-on experience with the school prior to enrolling. To that end, they’ve created some nice opportunities to do so, including the ability to spend a day at the school while classes are in session. Potential boarders are also able to spend an evening in the residence, meeting the staff and potential peers. One student recalled his trial visit, saying that “it was really fun to get to know the students a bit more.” No doubt it eased his transition into the school. There is ESL offered on site during the school year, as well as residential ESL programs in the summer. For students arriving from overseas, the summer programs can help grant a sense of what to expect when enrolling in the academic programs. Likewise, visits can make the transition to Pickering an easier one, and we strongly suggest that all families make the most of those opportunities. Arriving at school knowing what to expect and where to go, and with a growing sense of ownership of the environment—the idea that “this is my school”—can be invaluable in easing a student’s acclimation. Day students are encouraged to attend a half day. The admission officers also recommend speaking with alumni and current parents, and they are happy to supply contacts for those. That kind of research, too, is very much worth any effort you’re able to give it. The fee schedule is as detailed as you could ever hope to find, with the goal being to ensure that there are no surprises. It’s extensive, certainly to a degree that we haven’t seen elsewhere. The desire is to ensure absolute transparency, and the fee schedule achieves that. Parents likewise report that there are no surprises in terms of additional fees, as their children move through the program. Extra costs can be incurred based on the kinds and number of activities a student is involved in. Parents, though, recognized this as typical of any private school, and note that costs are always up front and very clearly expressed. The tuition level is absolutely in line with what you’d expect of a school of similar academic profile. The parents we spoke with felt that it is money very well spent. Pickering College is keen to involve the entire community within the ongoing life of the school. When we were touring, we passed our guide’s mother in the hallway. She was on campus volunteering. Similarly, a retired teacher turned alumni ambassador, Mr. Boyd, is often on campus. They, and indeed many others, add to the students’ conception of what the school community is and who it includes. Ask a student to name the longest serving teacher at the school and, more often than not, they’ll say “Mr. Boyd!” Press them for names of alumni they know, and they’ll mention names such as Sterling Mancuso—“he’s very smart, a great debater, who went to the world championship last year in Australia,” says a student—who either are recent students or those who have returned to meet with students and describe their academic and career paths after leaving Pickering. Like them, parents and alumni are visible and welcome to participate within the life of the campus. It’s telling that very many do. Pickering College was founded as the West Lake Friends’ Seminary by Quakers in 1842 and, as you might expect, has had a long and interesting history since. Canada became a dominion, the school amalgamated, some buildings burned down, others were built up. It began as a coed school—something unique at the time—and as such provided an expression of the Quaker ideal that both genders should be educated equally. That was groundbreaking. It was also the first school in North America to offer a course in typewriting, symbolic of the school’s desire to incorporate new ideas and technologies and to educate students with an eye to the world they would enter upon graduation. Times, of course, have changed, though certainly many of the values that the school upholds today reflect those upon which it was founded, including a desire to embrace new ideas and to support a diversity of interests. The ideal student is a curious, well-rounded one who demonstrates character and shares the values of the school, will contribute to school life and is willing to work hard and risk being the best person that they can be. 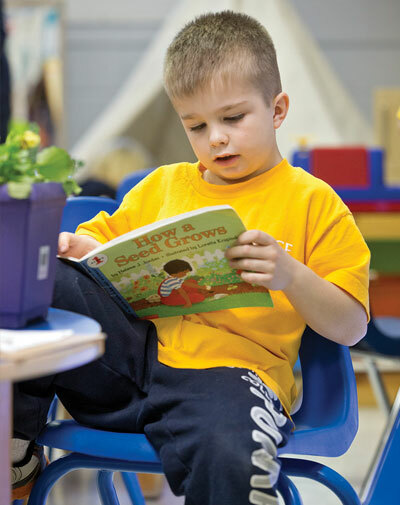 The student is one who will thrive in a supportive yet challenging academic environment.